Lifting the lid on a bog standard feature. Behold the toilet from SOMA. Interactive, realistic, beautiful. There came a point in history when humans stopped shitting on the ground and started shitting into a receptacle, and the toilet was born. The people of Mohenjo-daro, an ancient settlement uncovered by archaeologists in Pakistan, were using toilets as far back as 2800 BC. The Romans figured out how to flush them long before the invention of the iPad. And the Han Dynasty built their toilets above pigsties so they could simultaneously empty themselves and feed their livestock. Today, the human race’s obsession with the humble commode, and the activities that occur in and around it, has manifested itself in an exciting new way: the videogame toilet. I’ve always been fascinated by the idea that every time work begins on a new game, someone has to model, texture, animate, script, and record sound effects for something so mundane. 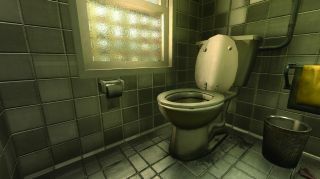 But the truth is, videogame toilets are incredibly important. A grotty Hebridean toilet from Dear Esther. Toilets also reveal something about the people who build them. You can tell a lot about a developer’s approach to world-building by the authenticity, and flushability, of its crappers. “They’re a direct peek into a studio’s personality,” says Blendo Games’ Brendon Chung. “It’s very personal and it’s very revealing. We spend a lot of our lives trying to understand each other, and a toilet is a moment of vulnerability. Trevor’s toilet in GTA 5 is beyond cleaning. “One of the big problems in game design is figuring out what to fill the world with,” says Frictional’s Thomas Grip. “Offices and storage rooms are used a lot, but it can be hard to make them feel natural. But with bathrooms the space is well-defined and there are a lot of simple and fun interactions such as flush handles, stall doors, and hand-dryers. Futuristic curves in Portal. Nice. One of the Greenbriars’ many loos in Gone Home. But toilets are more than just props. A toilet is a porcelain window into the soul of the artist who created it, and through it you can learn a lot about their personality and their design philosophy. And they reveal something about us as players too. Our expectations, desires, and what it takes to make us believe in a game world. So the next time you pass a virtual toilet and, of course, attempt to flush it, take a closer look at what happens. You may be able to divine some hidden truth about the game you’re playing and the people who made it.